Grief and bereavement affects many areas of our lives. Many clients are surprised to find how overwhelming their emotions can be during times of great distress. People are often affected emotionally, behaviorally, physically, spiritually, and cognitively when they experience a significant loss. Grief counseling helps people manage major life changes, such as death of a loved one, divorce, infant loss, job loss and other losses. Because grief impacts our lives on various levels and at varying intensities, it’s healthy and important to cope with grief. For some people, grief counseling is the best way to help identify and manage their thoughts, emotions, and behaviors related to dealing with grief. At Grief Recovery Center, all of our beneficial therapy programs are provided by fully licensed Houston therapists and grief recovery specialists. Many people assume that grief counseling is meant for when you have lost a loved one. However, humans grieve many areas of their lives. It’s important to address these transitions and situations properly to make the appropriate life changes and transition easier to manage. Grief counseling is a form of therapy that helps you identify the issues, situations, or events that have brought about grief in your life and helps you make a plan to move forward. All counseling sessions are led by licensed therapists and grief recovery specialists so you’ll feel confident in the guidance you’re receiving. Counseling can take on many forms, and our grief recovery specialists will be able to help you identify the most appropriate and realistic ways to begin the healing process. Bereavement counseling is a form therapy to help you after you lose a loved one. The loss of a family member can cause emotional and psychological stress, which can be hard to overcome without the proper tools and resources. You may experience various stages of emotions after losing your family member, friend, or pet, and our counselors can help you as you work those stages of loss. We understand there is no one way cope with this type of loss. We’ll work with you to create a plan that is right for you, allowing you to begin the healing process on your own terms. Why Should You Consider Grief Counseling? There are many reasons you may come to Grief Recovery Center to seek help. The most apparent reason you may reach out to our highly-trained and experienced grief recovery specialists is that someone in your life has died. 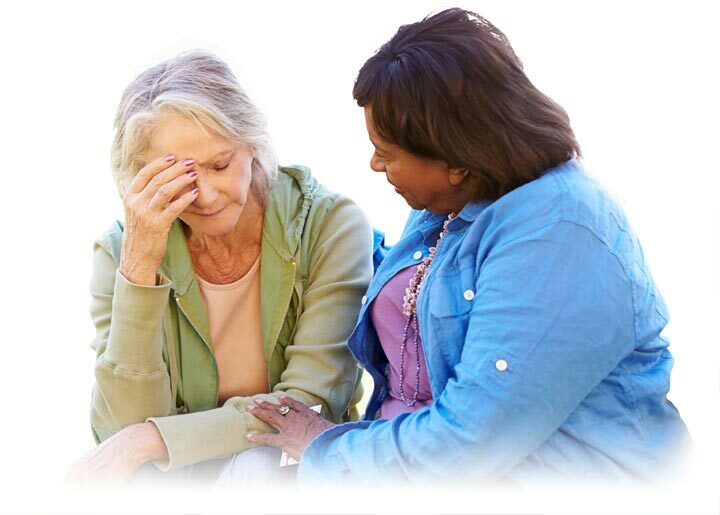 In addition to helping you and your family manage the grieving process related to death, our grief recovery specialists can work with you if are grieving due to the loss of a relationship, the loss of a job, people who have moved and have lost friends or routines, new mothers who find themselves suddenly out of the workforce, those who aren’t sure of their new role in life, and other difficult transitions. What Can You Expect From Grief Counseling? When it comes to working with Grief Recovery Center, our Grief Recovery Specialists and licensed therapists help you make meaning of the loss that has occurred in your life. It is very common for people to feel like the world is against them when they are experiencing overwhelming grief. Our therapists will help you make meaning of your loss and help you navigate through your grief journey. We work with you to help you adjust to your new normal, including creating and establishing new routines without a person, relationship or job that once existed in your lives. Identifying feelings and emotions is an important part of the grieving process because when you can name your emotions, you’re better equipped to manage them. It’s common to not know what you feel, which can be a major roadblock in the healing process. We’ll walk you through the process of dealing with unhelpful comments and how to manage the urge to blame others. Working toward family rituals or anniversaries, we help you prepare for unexpected and expected feelings and emotions during important times of the year. This can be very helpful in managing your day-to-day routine to ensure you don’t relapse. Our qualified grief recovery specialists will help you come to terms with your new identity as a single person, widow, or person in search of a new career. Finally, you’ll work towards identifying triggers that could cause you to relapse in your recovery process so that we can work together to determine coping mechanisms and ways to thrive in life. While it may be obvious to some that they are grieving over the loss of a loved one, it might be less obvious to people who are experiencing grief related to other areas of their lives. There are many signs and symptoms related to grief, and many of these symptoms manifest themselves in a physical way. Because people work hard to dull their thoughts and emotions during tumultuous times, physical symptoms can often help trigger the identification of grief for people. One of the most important parts of the grieving process is sharing thoughts and feelings related to grief. For some, sharing in an open and safe environment may suit one best, while others prefer the privacy of a one-on-one session with a grief recovery specialist or licensed therapist. Ignoring the grieving process is not recommended. It can cause long-term negative effects and prevent you from living your life in a meaningful way. When people put grieving off or don’t acknowledge the grief they are feeling, it can impact their lives in the future and cause problems in future relationships and even jobs. What Therapy is Available to Manage Grief? At Grief Recovery Center, we offer a variety of counseling and therapy programs to help you manage many areas of your life, including individual, family, couples, or group counseling. Individual counseling is helpful for those who are comfortable sharing in a private, one-on-one environment with their trusted grief therapist. Family and couples grief counseling is beneficial for those that have experienced loss as a unit. This counseling focuses on how each individual in the unit is affected by the loss. Is Long-term Grief Counseling Available? When it comes to dealing with grief, there is no magic formula that will cure people of their grief. The most effective grief programs identify feelings and emotions and work toward managing those emotions. It’s important to understand what a person thinks about grief and the situation they find themselves in as a way to manage grief. At Grief Recovery Center, we offer the Grief Recovery Program delivered by a grief recovery specialist. This action-based program provides the correct action choices that help people move beyond the pain caused by loss. The program provides a safe environment to look at old beliefs about dealing with loss; to look at what losses have affected your life; and to take new actions which lead to completion of the pain attached to one of those losses. The grieving process is different for everyone, and some may require more time to make meaning of their new lives and to feel confident in their ability to move forward in their lives. At Grief Recovery Center, we know that grief is deeply personal, and we’ll never rush you to move to the next stage of the grieving process until you’re ready. What Is Group Grief Counseling? Group counseling takes place with a group of grievers, usually 5-12 members, and is facilitated by a grief therapist. Groups are structured by type of loss (child loss, divorce, pet loss) or setup as general grief groups (a variety of losses). It is common, and often recommend, that different forms of grief counseling are incorporated into the healing process. Clients typically find that they can relate to others who have experienced loss, despite the type of loss and the differences in the lives of others. It is a very inclusive and safe environment for everyone to share. Group grief counseling can be an effective way to manage grief in long-term ways. Many find that sharing their stories helps others deal with grief as well. The mutual sharing that takes place is beneficial for all who are involved, with even the quietest clients in the group find that they get something out of the process of listening to others. If you or someone you love is experiencing grief related to the death of a loved one, the loss of a pet, the loss of a relationship, job loss, or another life-changing event, contact one of our grief recovery specialists today. Our dedicated and professional team at Grief Recovery Center is ready to help you navigate the grieving process so that you can start the road to recovery with the tools you need to begin the next stage of your life. Contact Grief Recovery Center to schedule a phone consultation by calling us at (832) 413-2410 today. Don’t put off getting the help you need to reconcile your feelings related to the grieving process. Our certified grief recovery specialists are ready to help you start the healing process today.